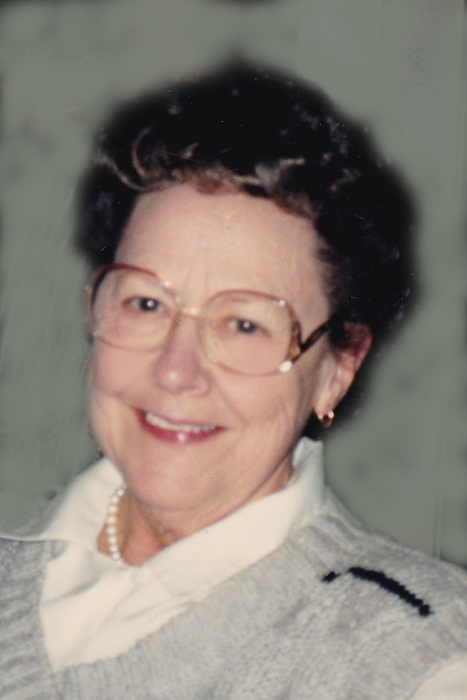 Obituary for Arlene Goebel Seeds | Esterdahl Mortuary and Crematory, Ltd.
Arlene Goebel Seeds, 96, of Moline, died at Bickford Cottage in Moline on Monday, April 1, 2019. Visitation will be held Friday, April 5, 2019, from 10:00 a.m. until 12:00 p.m. at Esterdahl Mortuary & Crematory, Ltd., Moline. Funeral service will begin at 12:00 p.m. immediately following the visitation. Entombment will be at Moline Memorial Park. Memorials may be made to St. Mary’s Parish in Moline. Arlene Mary Wyffels was born on a farm in Geneseo, Illinois on April 9, 1922, to Alphonse and Blanche Vandersnick Wyffels. She graduated from Geneseo High School, Class of 1942—a very special class that celebrated its 65th Alumni Reunion in 2007. She was employed as an executive secretary at International Harvester East Moline Plant in earlier years. She was a member of St. Mary’s Parish in Moline and active for many years in St. Mary’s pastoral care department, administering Holy Communion and cheer to parishioners in nursing homes and assisted living. She was also a longtime member of St. Mary’s Altar & Rosary Society. Arlene had deep faith, compassion, joy and humor. She loved time with family and friends as well as travel, including trips to the Caribbean with three generations and Rome for an audience with the Pope. On May 27, 1950, Arlene married Arthur J. Goebel. He preceded her in death on February 10, 1981. On November 24, 1989, she married Robert G. Seeds. He died on July 15, 1991. Survivors include her daughter, Nancy (Dr. David) Engstrom of Grafton, Wisconsin and her son, Dr. Gary (Dr. Catherine Carter) Goebel of Moline. Her grandchildren are Lisa (Cory) Robertson, Jennifer (Richard) DeLaCruz, Eric (Amie) Engstrom, Katie (Marshall) Clark, Dr. Thomas (Morgan) Goebel and Katherine Goebel. She has eight great-grandchildren. She is also survived by her stepchildren, Dawn (William) Ratzburg, Robert (Kim) Seeds, Jr., Faith (Dr. Jon) Aagaard and Michelle (Jon) Tunberg. Her step-grandchildren are Erik Ratzburg, Courtney (Adam) Schaeffer, Michelle (Patrick) Borchard, Robert (Rachel) Seeds, Theodore (Samantha) Seeds, Priscilla (Nick) Angelich, Jon Aagaard, Greg (Carly) Aagaard, Annie (Greg) Sparacio, Thomas (Bianca) Aagaard, Jenna (Ryan) Seager, Annika Tunberg, Robert (Mikaela) Tunberg and Ingrid Tunberg. She has fourteen step-great-grandchildren. She is additionally survived by her sisters-in-law, Darlene Wyffels and Elizabeth Wyffels. There are also many loving nieces and nephews, grandnieces and grandnephews. She was preceded in death by her parents and four brothers, Edward, Marvin, Vernon and James Wyffels. The family would like to extend a special thank you to Bickford Cottage of Moline and Heartland Hospice for the wonderful care given to their mother.